So, the attempt at weight loss is still going on and though the last two weeks have been a bit of a struggle as far as eating the right foods is concerned, mainly because of the amount of meals being eaten outside of the house and sometimes a tremendous lack of willpower, at home, most of the time, I’m trying to be good. I’ve been told to eat the proteins at lunch and stick to vegetables and a small amount of carbohydrates at night (all the better if I can eat my dinner before 7 p.m.) so I’ve been trying to make the meals a bit different to avoid monotony such as my sun-dried tomato fish with charred vegetables and will have to now keep trying new things to last me a lifetime. How do you make chicken and vegetables and fish and vegetables taste different every day? Keep changing the marinade and the vegetable combinations. This time I went with a simple balsamic vinegar, honey and mustard marinade and was not disappointed with the results. The mustard, called Kasundi, featuring a combination of mustard and mango and various spices, is a concoction particular to Bengal and is wildly popular with Bongs (colloquial for Bengali’s) anywhere. We use it as a sauce, as a mixer with various leafy vegetables and rice and of course, in marinades. It’s going to feature heavily on this blog a lot so go grab a bottle or two from your nearest grocery store and go nuts with it. I’m using half the chicken breast here as my appetite is not that big and it does fill you up. The other half, I’ve kept in the marinade for my lunch tomorrow (less work). 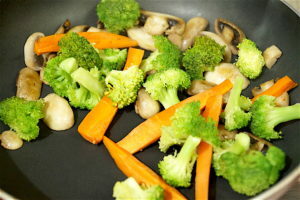 You can use the whole piece if you want, and add more vegetables, if you want an even ratio for the stir fry. The flavouring is subtle but if you want more, can make extra marinade without the ginger and garlic and pour over. 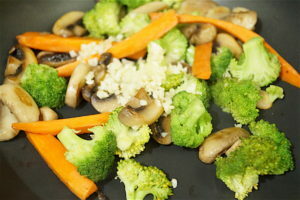 I like my vegetables charred a bit as it takes away the veggie taste, but you can make it according to your preference. This is a one-marinade-covers-all dish and so easy and hassle free and can be prepared in less than seven minutes if you have everything prepped and ready (which will also take not more than 15 minutes). For someone like me, who hated all vegetables other than potatoes till I turned 24, it has been a turnaround. Earlier, if you showed me broccoli, mushrooms, red and yellow peppers, cabbage and so on, I would have gone running to the hills. Now, I love them. Funny how tastes change, in more than just food choices. There was also the realisation that if you want to live a healthy life, you need vegetables in your diet. The more varied colours, the better. The past one and a half months, with a diet of predominantly fruits, vegetables, fish, chicken, yoghurt, and grains, an avoidance of deep fried foods, desserts and sweets (which I was eating daily before, but restrict to once or twice a week and smaller quantities), my skin is glowing and I’m feeling a lot better. Of course, the weight is down substantially too. I still cheat a few days with high calorie foods, but it has become an exception and not the norm and yes, I brisk-walk at least seven kilometres a day six days a week nowadays. No results without hard work. On that note of wisdom, I leave you with my stir fry. Cut the chicken breast in half horizontally, separating the top from the underside. In a bowl, mix the balsamic vinegar, honey, kasundi, garlic paste, ginger juice, salt and pepper nicely till all the flavours meld together. Add the chicken, coating both sides and keep in the fridge for an hour. After an hour slice the chicken into thin strips or dice them into cubes. Use only the bottom half of the chicken and reserve the top part for the next meal if you don’t want the whole breast. 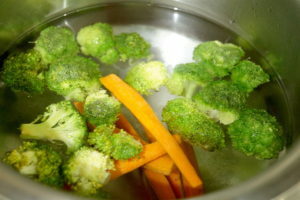 Boil water, turn the heat off and throw the carrots and broccoli into the water for two minutes and transfer into a bowl. In a non-stick pan, add the olive oil and heat on high. When hot (but not smoking) add the mushrooms and stir on high for a minute. Then add the carrots and broccoli and toss for 30 seconds. Add the salt and chilly flakes and toss a bit. Then add the garlic and toss. If you’re using half the chicken breast, add that to the vegetables, making sure they’re getting cooked from both sides (10 seconds per side) and toss well. 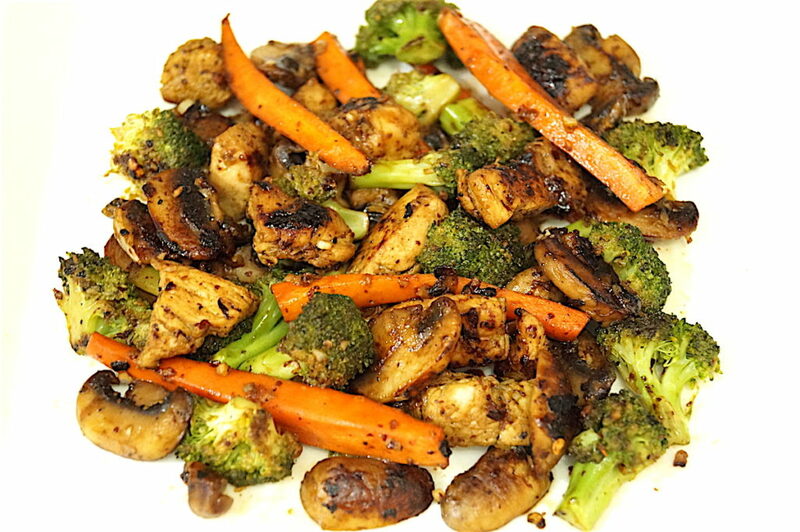 Add two tablespoons of the balsamic marinade to the vegetables and chicken and keep stirring on high heat for a minute till all the vegetables and chicken are coated with the marinade. Transfer to a plate and eat immediately. If you’re using the whole chicken breast, throw all the marinade in. 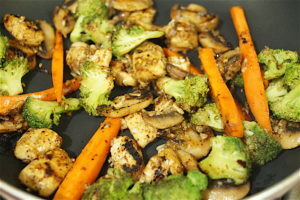 You may need to add more vegetables to the pan before hand if you want an even ratio of chicken to vegetables. You may also need to share the dish with someone else! Important notes: Cook the stir fry for not more than 1.5 minutes after the chicken has been added, else the chicken will be overcooked. 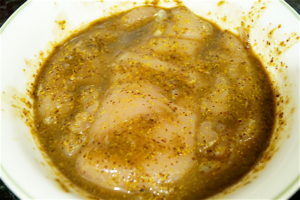 You can even keep the chicken marinating overnight or for a couple of days in the fridge. 1. 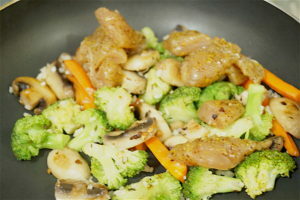 Marinate the chicken in the balsamic vinegar mixture for at least one hour. Cut half the chicken into bite size pieces. 3. Blanch the broccoli and carrots in boiling water for 2 minutes. 4. 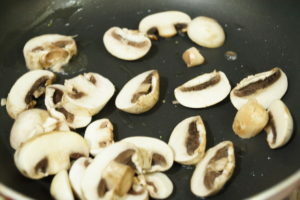 In a non-stick pan, heat oil and fry the mushrooms on high for a minute. 5. Add the broccoli and carrots and toss well for 30 seconds. 6. Add the salt, chilly flakes and garlic and toss. 7. 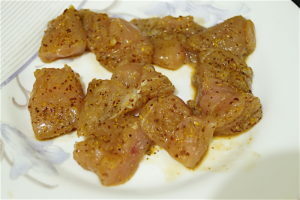 Add the chicken, cook on both sides for 10 seconds each and add two tablespoons of marinade. 8. Toss for another minute and serve immediately.